I finally read a book I’ve been meaning to go through for some time. 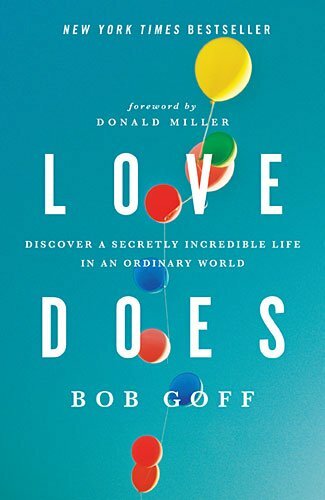 I’ve wanted to read Love Does ever since I went to Donald Miller’s Storyline conference a couple of years ago and heard about Bob Goff. Let me tell you, this book was such a lively and unique read. My recommendation is to go out and get Love Does by Bob today. Throughout the book, I was constantly reminded that love is not a theory, it’s not something you can quantify or theoriticize (let’s make that a word). If we can talk about love and can write about it, then I’m afraid we just don’t know what love is, for knowing what love is requires action. Bob Goff would consistently affirm that love does. Love doesn’t just stop at thinking or planning for it, love takes action. Love is not safe. When we choose to move from the theory of love to actually loving someone, then we can see how costly love truly is. Love is filled with vulnerability, risk taking, and it shatters our world. When we choose to love others, we move from looking in to looking out at the world, actively engaging it. Whimsy is another big theme in this book. Love does memorable acts and it brings joy to other people. Love goes with people on adventures and it invites others onto a path centered on an incredible life amid ordinary times. Love brings whimsy, it brings new adventures that are meant to be shared with others. For me, I’m going to go on more adventures, even in the ordinary times, even if I cannot fly to London on a spur the moment trip for high tea with my daughter. Instead, we’ll have other adventures that aren’t as far away but are just as fun. Love takes risks and is meant for all. Love does not stop at warm thoughts and fuzzy feelings. Love takes action, makes life interesting and more incredible. Love does because that’s how love rolls.